COLLEGE PARK, Md. – A team of astronomers led by Erin Kara, the Neil Gehrels Prize Postdoctoral Fellow in the University of Maryland’s Department of Astronomy, has provided the clearest picture to date of exactly how black holes generate massive X-ray outbursts. And their findings may help settle a long-standingdebate about where around a black hole these outbursts originate. Using NASA’s Neutron star Interior Composition Explorer (NICER) instrument aboard the International Space Station, the team detected an enormous explosion of X-ray light from a recently discovered small (star-mass) black hole as it consumed material from a companion star. By measuring the differences, or lag times, between these X-rays and the “echoes” of these X-rays reflected off swirling gas near the black hole, the researchers revealed information on how the black hole changed during the outburst. In a study published January 10th in the journal Nature, the team reports evidence that as the black hole consumed material from a nearby star, its corona—the halo of highly-energized particles that surrounds a black hole—shrank significantly. “We don’t really understand the source of these relativistic jets [X-ray burst] that are basically common in many accreting systems. However, these results indicate [the process] really is driven by the change of corona,” said Kara, the lead author of the paper, who is also a Hubble Fellow with a co-appointment at NASA’s Goddard Space Flight Center and the Joint Space-Science Institute a UMD and NASA Goddard collaboration..
Black hole J1820, studied by the team is located about 10,000 light-years from Earth. Its existence was unknown until March 11, 2018, when the outburst was spotted by the Japanese Aerospace and Exploration Agency’s Monitor of All-sky X-ray Image (MAXI), also aboard the space station. In the space of a few days, it went from a totally unknown black hole to one of the brightest sources in the X-ray sky. NICER was used to quickly capture this dramatic transition and continues to follow the fading tail of the eruption. A black hole can siphon gas from a nearby companion star and into a ring of material called an accretion disk. Gravitational and magnetic forces heat the disk to millions of degrees Celsius, making it hot enough to produce X-rays at the inner parts of the disk, near the black hole. Above the disk is the corona of a black hole, a region of subatomic particles heated to 1 billion degrees Celsius that glows in higher-energy X-rays. Many mysteries remain about the origin and evolution of a black hole’s corona. Some theories suggest the structure could represent an early form of the high-speed particle jets these types of systems often emit. Astrophysicists want to better understand how the inner edge of the accretion disc (the spiraling ring of material being pulled in by a black hole)—and the corona above it—change in size and shape as a black hole consumes material from a companion star. If scientists can understand these changes in stellar-mass black holes over a period of weeks, they could gain new insights into how supermassive black holes evolve over millions of years and how they affect the galaxies where they reside. In this case the research team used a method called X-ray reverberation mapping to study changes in this black hole during its X-ray outburst. This technique uses X-ray reflections in the environment of a black hole in much the same way radar is uses sound wave reflections to map undersea terrain. Some X-rays from the black holes corona travel straight toward us, while others light up the disk and reflect back at different energies and angles, plotting these reflections over time allows changes in the black hole to be mapped. X-ray reverberation mapping of supermassive black holes has shown that the inner edge of the accretion disk is very close to a black hole’s event horizon— the point beyond which no matter or energy can escape. The corona is also compact, lying closer to the black hole rather than over much of the accretion disk. Previous observations of X-ray echoes from stellar mass black holes suggested the inner edge of the accretion disk could be quite distant—up to hundreds of times the size of the event horizon. However, J1820 behaved more like its supermassive cousins. As they examined NICER’s observations of J1820, Kara’s team saw a decrease in the delay, or lag time, between the initial flare of X-rays coming directly from the corona and the flare’s echo off of the disk. This indicated that the X-rays traveled over shorter and shorter distances before they were reflected. According to Einstein’s theory of relativity, time runs slower in strong gravitational fields and at high velocities. When the iron atoms closest to the black hole are bombarded by light from the core of the corona, the wavelengths of the X-rays they emit get stretched because time is moving slower for them than for the observer. Kara’s team discovered that J1820’s stretched iron K line remained constant, which means the inner edge of the disk remained close to the black hole. This indicated that the disk was not the source of the X-rays. These observations give scientists new insights into how material funnels into a black hole and how energy is released in this process. The research team and other scientists say that these new findings point to the corona and not the disk as the driver of the evolution of X-ray outbursts in stellar-size black holes, but other studies in similarly sized black holes are needed. “These observations also offer a new framework through which to study the evolution of accretion in supermassive black holes,” Kara said. COLLEGE PARK, Md. – The Foundation for Food and Agriculture Research for the first time has awarded a UMD researcher the foundation’s “New Innovator in Food and Agriculture Research Award”, designed to invest in the next generation of scientists committed to changing the way food is grown, processed, and distributed. University of Maryland Assistant Professor Yiping Qi, department of plant science and landscape architecture, was one of only nine U.S. early-career researchers who in late December were given the foundation’s 2018 award. With support from the foundation and matching funds from Syngenta, Qi’s new award totals $560,000. Qi recently also got a $500,000 grant from the Biotechnology Risk Assessment Grant Awards Program (BRAG) from USDA-NIFA for a combined funding of more than $1 million for his work to perfect CRISPR technology and its application for creating better food crops. “CRISPR technologies are revolutionizing biology, agriculture, and medicine. CRISPR can be thought of as molecular scissors that cuts DNA so that the piece related to a certain trait can be removed, replaced, or edited,” said Qi. Qi and others say CRISPR, as a new precision breeding technology, will enable scientists and breeders alike to do the same things once done with traditional cross-breeding programs, but in a much shorter amount of time. The goal is to help ensure global food and nutritional security and feed the world by accounting for new issues like disease resistance, pests, heat, drought, and other major concerns of a changing climate and growing population. Earlier this year, Qi published papers in Genome Biology and Plant Biotechnology Journal looking at the specificity of CRISPR Cas9 and Cas12a in rice and maize, respectively. Qi and his team were the first to assess CRISPR Cas12a for off-targeting by whole genome sequencing in any higher organism. With the $500,000 in funding from USDA-NIFA, Qi will be similarly using the concept of whole genome sequencing to look at how efficient and specific base editing is. Base editors are CRISPR-derived technologies for making DNA changes down to a single base pair. A base pair is one A, T, C, or G and its corresponding counterpart in a sequence of DNA. Single base pair editing is highly specialized and specific, but can still result in significant changes in traits that are expressed. Click here and here for guidance from the White House Office of Management and Budget. Specific agency contingency plans can also be found here. A government shut down, even a partial one, can have significant negative impact on advanced research projects at UMD and all US research universities.The negative consequences are greater, the longer the shutdown lasts. Congress has already approved funding for several federal agencies that support the university, including the Department of Defense (DOD), the Department of Labor (DOL), the Department of Health and Human Services (HHS), the Department of Education (DoED), the Department of Veterans Affairs (VA), and the Department of Energy (DOE). These agencies will continue to operate as usual. Congress has yet to pass funding for several agencies that are important to the university, including the National Science Foundation (NSF), the Department of Commerce (including NIST, NOAA, and EDA), the National Aeronautics and Space Administration (NASA), the Department of Homeland Security (DHS), the Department of Justice (DOJ), the US Department of Agriculture (USDA), the Food and Drug Administration (FDA), the Department of Transportation (DOT), the State Department (including USAID), the National Endowment for the Arts (NEA), and the National Endowment for the Humanities (NEH). The FAQ below applies to individuals on campus that are working with these agencies in some capacity. 1. What is the impact on federally-funded research projects? No new grants or contracts are usually awarded during a shutdown. Researchers can likely submit proposals, but they will not be reviewed until the government is operational again. A shutdown can also have negative impact on our research partnerships and collaborations with federal agencies. Work may continue on most federally-funded projects that have already been awarded. Routine administrative and support services provided by federal agencies to grant and contract recipients likely will not be available. Awarded projects may be disrupted during a shutdown if they are housed in a federal facility, if the project includes federal personnel, and/or if an award includes restrictive terms and conditions that require administrative action to approve a drawdown of funds. Federal agency staff likely will not be available to approve no-cost extension requests, grant transfers, re-budgeting approvals or other actions requiring agency approval. 2. What is the impact on federal financial aid? The partial shutdown will not impact federal financial aid programs supported by the Department of Education as Congress approved FY2019 appropriations for these programs. 3. What is the impact on veterans’ education benefits and services? 4. What is the impact on immigration services? Because these activities are funded by fees, most of these services are expected to remain operational during a shutdown. For additional information, view the DHS shutdown plan linked above. 5. What is the impact on international students at UMD? If you have questions or concerns about how the shutdown affects you as an international student, please contact UMD’s International Student & Scholar Services office at 301-314-7740. 6. What is the impact on students who are interning with federal agencies? How will this affect internship credits earned? Students who have an internship with a federal agency should contact their supervisor to determine how their work is affected by the shutdown. Students should also contact their internship coordinator at UMD to determine any effects on credits being earned. 7. Will the Metro still run? The metro’s service and schedule are not affected by the shutdown. COLLEGE PARK, Md. – Humans aren’t the only species that have dinner parties. Scientists have observed many animals, including bats, eating in groups. However, little was known about whether bats actively help each other find food, a process known as social foraging. With the help of novel miniature sensors, an international group of biologists that included University of Maryland Biology Professor Gerald Wilkinson found that bat species foraged socially if their food sources were in unpredictable locations, such as insect swarms or fish schools. In contrast, bats with food sources at fixed locations foraged on their own and did not communicate with one another while foraging or eating. The results of the study were published recently in the journal Current Biology. The researchers selected five bat species from around the world for the study—two species with unpredictable food sources and three with predictable food sources. They fit each bat with a small, lightweight sensor that operated for up to three nights. Because the sensor only weighed approximately 4 grams, it did not hinder the bat’s movements. The sensor recorded GPS data to log each bat’s flight path and audio in ultrasonic frequencies to document bat calls. The researchers recaptured each bat to download the data. In all, the researchers tracked 94 bats in this study. 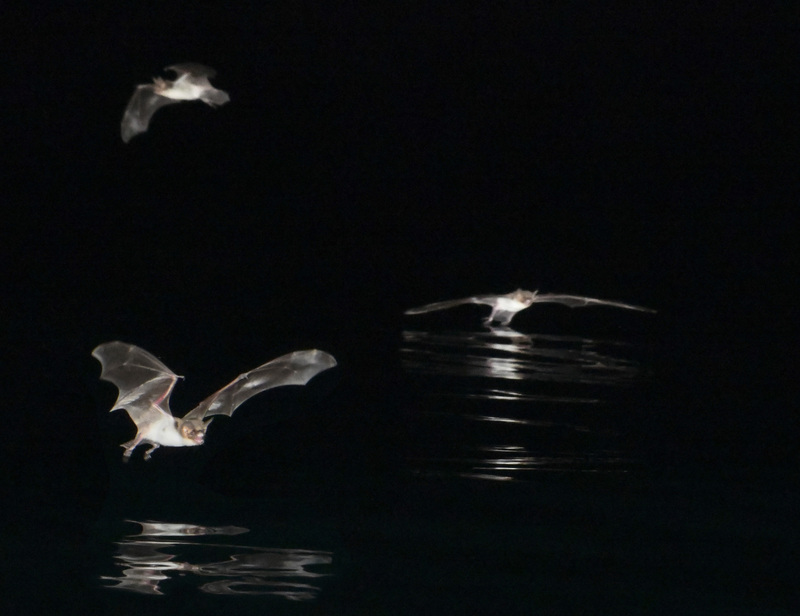 Edward Hurme, a UMD biological sciences graduate student in Wilkinson’s laboratory and a co-lead author of the paper, tracked one of the bat species—the Mexican fish-eating bat, which lives on a remote Mexican island. COLLEGE PARK, Md.—The University of Maryland will host its 2018 winter commencement ceremony on December 18, 2018 at XFINITY Center to celebrate this academic milestone for approximately 3,200 graduates from bachelor’s and master’s degree programs from across the university. The commencement address will be delivered by John B. King Jr., former U.S. Secretary of Education under President Barack Obama and current president and CEO of The Education Trust -- a national nonprofit that works to close opportunity gaps for students of color and students from low-income backgrounds. He will be joined by this year’s student speaker, Rehan Staton, who is graduating with a degree in history. XFINITY Center is located on Paint Branch Drive, near the intersection of Paint Branch Drive and Route 193/University Boulevard). Clickhere for directions. Media must park in lot 4B and enter the Xfinity Center through the loading dock.To ensure access to the ceremony, media must RSVP and show credentials upon entry. The ceremony will be streamed live on the University of Maryland’s YouTube channel,here. For more information, visit www.commencement.umd.edu. The University of Maryland campus and administrative offices will be closed on December 21, 2018 through January 1, 2019. Media inquiries sent during this time will be responded to as the university reopens. The University of Maryland has received reports of students with confirmed Adenovirus-associated illness, and are saddened that one of those students recently passed away as a result of the illness. Adenoviruses are common causes of colds, but there are strains that can cause more serious illness. We urge our community to take seriously this strain of a common virus. For the most up-to-date campus communications, timeline and FAQs regarding Adenovirus, visit https://health.umd.edu/adenovirus-resources. For information on the university's plans to expand the standard Winter Break residence hall cleaning program beyond their typical cleaning practices to include disinfecting frequently-touched surfaces inside student rooms, visit http://reslife.umd.edu/roomdisinfection/. The University of Maryland is deeply saddened to learn of the death of one of our students from Adenovirus-associated illness. Our condolences are with Olivia’s family and friends. Since learning of an isolated case of Adenovirus on November 1, we have been working with the state and local health department to track cases and inform our community how seriously to take cold and flu season - especially for anyone with special health circumstances or a weakened immune system. Crews are redoubling cleaning efforts in high-touch areas to tackle the spread of viruses, faculty have been given guidance to be flexible with students who are ill, and the Health Center is on high alert, using the state’s best practices for treatment and testing. We understand that there are concerns from our campus about how the virus spreads. The U.S. Centers for Disease Control and Prevention says that no link exists between mold and Adenovirus.